2015-12-21 Uncategorizedotimetot Enter your password to view comments. If you like planets, you still need to get up early. The two most noticeable planets throughout December, 2015, are dazzling Venus (brightest) and Jupiter (second-brightest). Look east before dawn! You can’t miss them. Then look for fainter Mars in between the two. Saturn will join the procession of morning planets, starting around mid-December. Mercury, though nominally an evening planet all month long, won’t be far enough from the setting sun to view till the final week or two of December. And check this out … if you’re in North America, you can witness an awesome planetary event on December 7 as the moon covers, or occults, Venus. Follow the links below to learn more about the December planets. Mercury, lone evening planet, visible starting around mid-December. 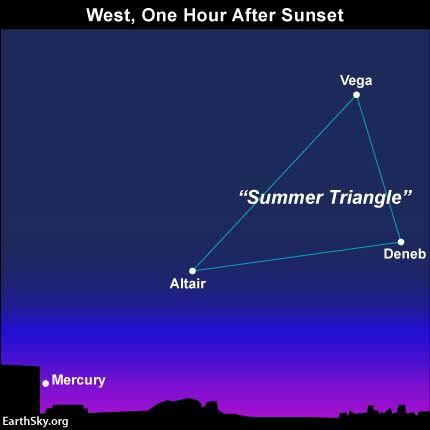 In early December, 2015, Mercury will be sitting too close to the sunset glare to be visible. However, we expect people from both Earth’s Northern and Southern Hemispheres to begin to see Mercury in the deepening dusk around the middle of this month. Late month will be best, with Mercury setting 80 to 90 minutes after the sun by the year’s end. Binoculars will help out with your Mercury quest. Mercury reaches its greatest elongation from the sun December 28 or 29 (depending on your time zone). Mercury will be well placed for viewing for a few weeks, centered on this date. If you live in the Northern Hemisphere, try star-hopping to Mercury from the Summer Triangle, as depicted on the above sky chart for late December. By the way, Mercury will swing back into the morning sky on January 14, 2016. Later in the January of 2016, Mercury will join up with the other four morning planets – Jupiter, Mars, Venus and Saturn – to feature the first appearance of all five visible planets in the same sky since the year 2005. Venus, brightest object in the east before sunrise. No matter where you are on Earth, here’s a very fun observation to make this month: Venus before dawn. Venus is the brightest planet and third-brightest sky object overall, after the sun and moon. When it’s visible, it’s very, very prominent in our sky. So step outside some early morning, and look east. You’ll surely see Venus shining there. What’s more, use this dazzling world and the planet Jupiter, the fourth brightest celestial object (after the sun, moon and Venus) to locate the fainter planet Mars in the morning sky. Simply look above Venus, but below Jupiter, to see the red planet Mars aligned with Venus and Jupiter in the December morning sky. And, no matter where you are … be sure to circle Monday, December 7, on your calendar. 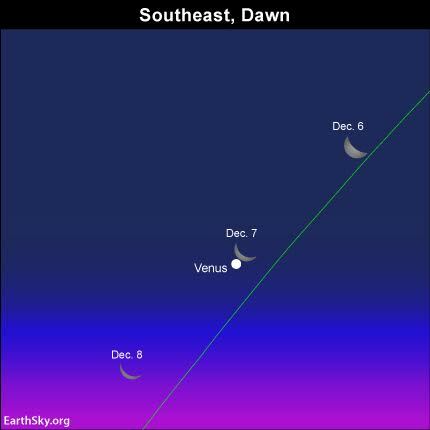 The waning crescent moon will have an extremely close encounter with Venus before (and after) sunrise on December 7. Residents of North America will be able to watch the moon occult – cover over – Venus. Depending on where you live in North America, this occultation will be visible in the predawn, dawn or daytime sky on December 7. More info about the occultation here. You won’t want to miss Venus and the other early morning planets – Jupiter and Mars – which glorify the predawn sky all month long. At mid-northern latitudes, Venus rises about three and one-half hours before the sun at the beginning of the month, and by the month’s end, rises about three hours before sunrise. At temperate latitudes in the Southern Hemisphere, Venus rises about two and one-half hours before sunup all month long. Mars shines between Venus and Jupiter. Mars is nowhere as bright as Venus or Jupiter. Even so, modestly-bright Mars is easily visible in the predawn sky. Mars shines in between Venus, the sky’s brightest planet, and Jupiter, the sky’s second-brightest, all month long. Let the waning crescent moon help guide your eye to Mars in the morning sky on December 5 and December 6. If you live in the right place in Africa, you can actually watch the moon occult -cover over – Mars in the predawn sky on December 6. Click here for details. Mars will continue to brighten month by month, until the Red Planet culminates in brightness in May, 2016. Believe it or not, Mars will be about as brilliant then as Jupiter is now! Jupiter, second-brightest planet, high before sunrise. Jupiter is the first of the morning planets to appear in the sky, rising in the east an hour or so after midnight local time at the beginning of the month. By the month’s end, Jupiter will actually rise before local midnight from both the Northern and Southern Hemispheres. 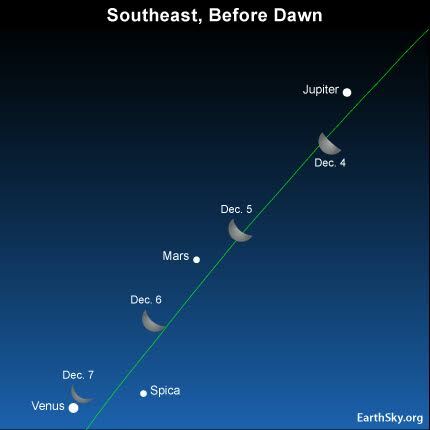 From all parts of Earth, the king planet Jupiter shines highest in the predawn sky, followed by Mars, Venus and then Saturn (visible near the horizon before sunrise, starting around mid-December). The waning crescent moon shines close to Jupiter on the mornings of December 3 and December 4. If you have binoculars or a telescope, it’s fairly easy to see Jupiter’s four major moons, which look like pinpricks of light on or near the same plane. They are often called the Galilean moons to honor Galileo, who discovered these great Jovian moons in 1610. In their order from Jupiter, these moons are Io, Europa, Ganymede and Callisto. These moons circle Jupiter around the Jovian equator. In cycles of six years, we view Jupiter’s equator edge-on. So, in 2015, we got to view a number of mutual events involving Jupiter’s moons through a high-powered telescope. Click here or here or here for more details. Click here for a Jupiter’s moons almanac, courtesy of Sky & Telescope. In the second half of December, draw an imaginary line from Mars through Venus to locate Saturn near the sunrise point on the horizon. The green line depicts the ecliptic – Earth’s orbital plane projected outward onto the great dome of sky. Saturn visible before sunrise starting around mid-December. Although Saturn is a morning planet all through December, it’ll be lost in the sun’s glare until about mid-month. Saturn will be fairly easy to locate by the end of the month, as this world rises about two hours before sunrise by the month’s end. How can you recognize this wonderful planet? 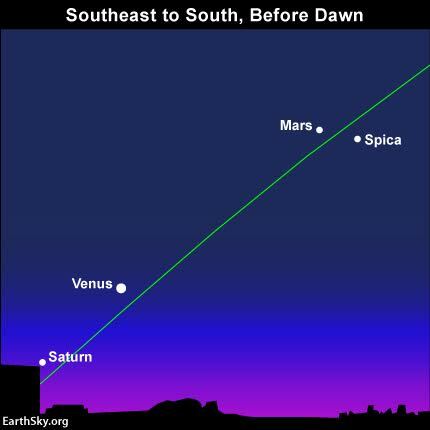 By drawing an imaginary line from Mars through Venus to spot Saturn near the sunrise point on the horizon, as shown on the sky chart above for late December. Binoculars may come in handy. Saturn, the farthest world that you can easily view with the eye alone, appears golden in color. It shines with a steady light. Binoculars don’t reveal Saturn’s gorgeous rings, by the way. For that, you need a small telescope. But binoculars will enhance Saturn’s golden color. Saturn’s rings are inclined at about 26o from edge-on in December 2015, exhibiting their northern face. A few years from now, in October 2017, the rings will open most widely, displaying a maximum inclination of 27o. As with so much in space (and on Earth), the appearance of Saturn’s rings from Earth is cyclical. In the year 2025, the rings will appear edge-on as seen from Earth. After that, we’ll begin to see the south side of Saturn’s rings, to increase to a maximum inclination of 27o by May, 2032. Look for all five visible planets in the predawn/dawn sky from about January 20 to February 20, 2016! Get Rid of Bad Breath, Tartar, and Plaque with Just One Ingredient! oil pull sqOil pulling is an ancient Ayurvedic practice used to help improve oral health and detoxification. It involves the use of pure oils in order to pull harmful bacteria, fungus, and other organisms out of the mouth, teeth, gums and throat. So how do you oil pull? It isn’t that hard at all – all you need is some coconut oil or sesame seed oil, and you swish it around your mouth for a short time each day in order to improve oral health. Oil can cut through plaque and remove toxins safely and effectively without harming the teeth or gums. Often caused by the by-product of chemicals and gases produced by bacteria in the mouth, halitosis can be an embarrassing social condition. If you get rid of the bacteria in your mouth through oil pulling, you can reduce bad breath! In fact, a study found that in a group of 20 adolescents, oil pulling therapy significantly reduced all markers for bad breath, and was just as effective as synthetic drug-store mouthwash! Like cavities, gingivitis and bleeding gums. Gingivitis is inflammation of the gums, and occurs when the immune system starts attacking bacteria in the plaque. Seeing as how coconut oil is an anti-inflammatory, it is extremely useful in this case. Cavities are also caused by build-up of harmful bacteria, which can easily be alleviated by oil pulling. Oil pulling helps strengthen the jaw, and so it can help alleviate TMJ and other soreness in the jaw area. At first, your jaw may be sore from the swishing, but over a course of time, your jaw will get stronger, and the pain will eventually diminish! Ditch the chemical-laden white strips! Oil pull instead! Did you know that conventional white strips for the teeth contain bleach, fluoride, tar, aspartame, aluminum and benzene? It is a toxic nightmare just waiting to happen. Almost every account of oil pulling has proven that it can help whiten teeth instantly! After two weeks, you will notice a much brighter, whiter smile, healthier gums and a nice pink tongue. When you eliminate toxins from the body, your skin will dramatically improve. Almost every account of oil-pulling I have found online has reported that their skin problems went away after just two weeks of pulling with oil. Conditions improved range from acne to eczema, psoriasis, and a variety of other dermatitis-related issues. A build-up of toxins in the body can lead to headaches and migraines. The standard theory that tension headaches are caused by widening of blood vessels, and migraines are caused by constriction of the blood vessels may hold truth, but recent evidence now shows that the major cause of both tension headaches and migraines is the retention of toxins or other tissue irritants in the nervous system. Oil pulling helps to eliminate bacteria and toxins from the body, so it has been documented in a variety of cases to help alleviate and even eliminate tension headaches and migraines! Overall, oil pulling is a great way to achieve full-body detox. Our mouth is the home to many bacteria, viruses, fungi, parasites, and the toxins they produce as a by-product. Their toxic waste solidifies in our body and can lead to a variety of different conditions. When our immune system becomes overloaded with excessive stress, poor diet and environmental toxins, then these organisms and their toxic wastes actually spread throughout the body causing disease and illness as a result of chronic inflammation. Oil pulling will help target these foreign invaders at the site of entry (the mouth), and will avoid them from further entering the body, and thus allow the body to completely detox. The benefits are astounding! By removing toxins from their initial site (the mouth), oil pulling helps alleviate the stress on the liver and kidneys to help filter these toxins if they were to further enter the body. Give your liver and kidneys, our two major detox organs, a break, and start oil pulling today! Oil pulling is a great way to aid in the correction of hormone imbalances, regulating menstrual cycles and reducing symptoms of PMS. By improving the functioning of our immune system via toxin removal in the mouth, we also improve the ability of our hormones to function naturally. Having a compromised immune system can throw a woman’s menstrual cycle off balance, and so oil pulling can help regulate our hormones. A variety of documented cases online have shown that oil-pulling has helped individuals completely eliminate their asthma symptoms and helps clear up bronchitis and congestion. These are largely the result of an inflammatory response in the body, which oil pulling can help lessen or reduce completely. Traditionally, sesame seed oil is used to oil pull – I believe the main reason this is, is because sesame seed oil was one of the most common healing oils back when this practice began. Now that we have access to virgin cold-pressed coconut oil, which is an anti-fungal, anti-bacterial, anti-viral, anti-inflammatory, and basically anti-everything, I would suggest using coconut oil as a means to oil pull. Since coconut oil is solid at room temp, you might want to lightly warm up coconut oil in a little saucer, but make sure you don’t heat it too high so you don’t destroy the healing enzymes in the oil. On the other hand, you can just put the coconut oil solid in your mouth, and it will eventually melt because the temperature of your mouth will be warm enough to melt it into a liquid. I would also recommend doing this in the morning, after you wake up, and after you have drank 1 litre of warm lemon water to help flush out toxins from the nights cleansing & fasting process. 1. Scoop 1-2 tsp. of coconut oil into the mouth. I suggest closer to 2 tsp. Let the coconut oil melt in the mouth before you start swishing in step 2. 2. Swish oil in mouth for 20 minutes. This 20 minutes is a magic number – it is long enough to break through plaque and bacteria, but not long enough to allow re-absorption of the toxins back into your saliva glands and mouth. 3. Spit out oil into a trash can. Do not spit this out into your drain! You can clog your drains by doing so. Also, do not swallow the oil or you will literally be swallowing an oil-full load of toxins. 4. Rinse with warm water. Warm water feels better than cold water, and helps to clean the mouth better. 5. Brush your teeth well! Brush your teeth with an all-natural fluoride-free toothpaste to ensure all bacteria is killed. Join me in a 30-day challenge! You can start whenever you want! I am going to start at the beginning of April, but you can start whenever you please, and continue for 30 days. I will post my results on instagram, and you can follow me there! I look forward to this journey and the healing benefits it will provide me with! Casinos are Furious About this 1 Trick: Man Makes Millions from Loophole! Millionaires In Prince George Are Doing Everything To Remove This Video. Watch Now ! If that sometimes too frequently includes YOU, I don’t need to tell you how horrible the hurt can be… or how it can make engaging in “everyday” activities difficult to downright unbearable! So please pay close attention to nature’s 7 most powerful ingredients below that have been proven to put a real end to your pain… and to do so faster than you may think! But at the end you’ll see how you can get ALL 7 of these top solutions easily! So first, what really causes joint pain? Typically, it occurs when the shock-absorbing, cushioning cartilage in your joints deteriorates with age, allowing your bones to rub together. This is more common as you age, as regular ‘wear-and-tear’ can cause your cartilage to breakdown. So, too, can injuries, repetitive motions (such as swinging a tennis racket) or abnormal postures. While your conventional physician may have suggested that medications like nonsteroidal anti-inflammatory drugs (NSAIDs) are your best option for relief, many are not willing to risk the increased likelihood of gastrointestinal bleeding, stroke, heart attack and other effects that can come with these drugs. And why should you risk it anyway? There are effective joint pain remedies that come right from nature to provide safe, long-lasting relief … if you haven’t yet tried them, get ready to send your joint pain packing. By strengthening cartilage and replenishing the synovial fluid that helps lubricate your joints, hydrolyzed collagen improves joint comfort and mobility. Hydrolyzed collagen is important, in particular, because it contains glycosaminoglycans (GAGs) such as hyaluronic acid (HA) and chondroitin sulfate, which help promote joint cushioning and lubrication. Hydrolyzed Collagen Type II may even help to rebuild cartilage. Glucosamine is found naturally throughout your body, but especially in your cartilage. In your joints, it acts as a building block and helps provide structure to your cartilage while maintaining healthy joint function and mobility. Research shows glucosamine sulfate is a safe and effective treatment for joint pain due to osteoarthritis. Chondroitin sulfate is essential for the structure and healthy function of your connective tissue, and is naturally found in the cartilage around your joints. It is known to work synergistically with glucosamine and has been shown to improve symptoms of joint pain and possibly even reverse joint deterioration. MSM contains a naturally occurring form of sulfur in the human body, which helps provide the raw material for cell creation and repair. MSM is important for the health of your connective tissues and the formation of collagen, and helps nourish your joints for optimal function. Phenylalaine is an essential amino acid that acts as a precursor to tyrosine and neurotransmitters like dopamine, norepinephrine and epinephrine. Phenylalanine may help to increase endorphins and opioid compounds in your central nervous system for enhanced mood and chronic pain relief. DL-phenylalanine works in part by blocking the enzymes that break down your body’s natural pain-killing chemicals. Used since Hippocrates’ time (400 BC) to reduce inflammation, white willow bark contains salicin, which is similar to the acetylsalicylic acid found in aspirin. White willow bark contains powerful anti-inflammatory flavonoids that relieve pain and inflammation. Its pain-relieving effects are said to last longer than relief from aspirin. Trace minerals like nickel, silver, zinc, tungsten and many others (72 in all) are essential for the proper function of your body and play a role in helping prevent degenerative conditions, including joint pain. Ionic minerals exist in an unstable state that allows them to bond readily with water so they’re easily absorbed by your body. Their positive or negative charges also combine into a dynamic electrical flow that helps move nutrients into your body.